It is practically a requirement to eat egg salad sandwiches the day after Easter. Or for an entire week after Easter if you have lots of kids who collected gads of eggs. Funny story actually, at my parents yesterday there were LOADS of kids scurrying about collecting eggs (we have a big family). Candy filled, some with money in them, bubble eggs, confetti eggs – we had the whole spectrum of oval-shaped delights. As I was watching kids eagerly scooping them up and into their baskets, I saw one little girl pick up a “real” egg. When she realized it wasn’t chocolate coated, sugary or filled with a treat/toy – she turned up her nose in disgust and put it right back where she found it. It was cause for great amusement among the adults who witnessed it, but made me a little sad that our kids don’t realize the simple joy of an egg anymore. Eggs are like the perfect food. In addition to being a great source of protein, the hard-boiled ones are easily transportable and delicious. I’m glad my munchkins brought home a bunch of them for me yesterday so I could make this salad for our sandwiches today. Egg salad is easy to adjust to your personal taste. Consider this a base recipe and go wild. If you have pickles, green onions or bell pepper around, any of them would be a great addition. Dill, curry or chili powder would make interesting varieties instead of the paprika. Don’t like mayo? Try using sour cream. Substitute dijon mustard for plain yellow. Add a splash of lemon juice or tabasco sauce. The possibilities are endless. Personally, I’m a simple girl with simple tastes. This basic recipe hit the spot perfectly today. I may just need another sandwich at “snack” time. Peel and coarsely chop eggs. Place the chopped eggs in a bowl, and stir in the mayonnaise, mustard and celery. Season with salt, pepper and paprika. Stir and serve on your favorite bread or crackers. This would cause a debate in my house. I’d make this batch for me than up the mustard for my wife. Great post. 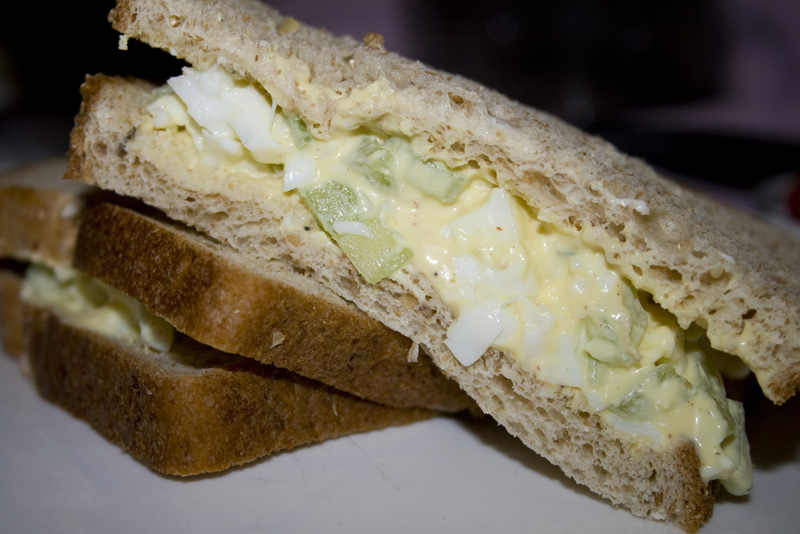 Aah, the all time favourite egg salad sandwich. Yummy. I usually add gherkin and finely chopped onion to my egg mayo. 3 hard boiled eggs in my lunch today – the perfect food is right!